This unit was a relaxing retreat with a wonderful large deck to watch amazing sunsets. As a long term resident for years at Ocean Harbor House condos as well as a repeat renter this was one of my favorite units. 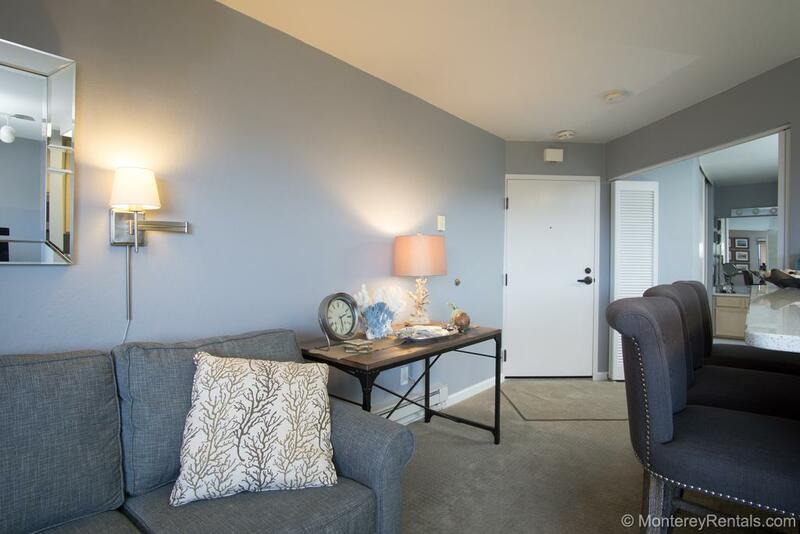 You're just steps from the sand in this newly-refurbished condo—and the first floor location (with covered parking right outside your door) makes it one of the most sought-after locations in the complex. Like a second living room, the large deck—with all-weather furniture, two chaise lounges, a bistro table and a barbecue—nearly doubles the interior living space, and there’s a Queen-size sofa sleeper in the living room for extra guests. The compact kitchen features sparkling quartz countertops and new stainless appliances (including a radiant cooktop and a convection range). The owner loves to cook, so you’ll find everything you need here—from a waffle maker and a rice cooker to a Keurig coffeemaker. The peaceful ambiance of this beachfront complex offers guests a reason to do absolutely nothing—yet the central location is convenient to everything. World-famous Monterey Bay Aquarium, Cannery Row, Fisherman’s Wharf, and the shops and restaurants of Old Monterey are all just minutes away. Tee off at any of the many fine golf courses nearby, explore Carmel, tour 17-Mile Drive, go wine tasting, or hike to secluded Big Sur beaches. You can also walk or bike on the coastal recreation trail—or take long walks on Del Monte Beach, one of the safest on the Peninsula (don't be surprised if you see sea lions, otters, or dolphins swim by!). Ocean Harbor House offers a weight room, two hot tubs, his and hers dry saunas, and two recreation rooms with pool and ping-pong tables. Laundry facilities are located on the premises. Note: One assigned parking space. Carport will accommodate a small or mid-size vehicle only.